On August 19, at the Henoko Exchange Plaza in Nago City, Yamato and Torachiyo take revenge on Yaguranuhiya in Kumiodori Yaguranuhiya. For three days from the 16th to 19th of August, Shichigachi mura odori was held at Henoko Exchange Plaza in Henoko, Nago City. More than 100 residents performed traditional dances and gave thanks for fertility. Shichigachi mura udui is held every three years in Henoko. On the 16th and 18th, more than 20 dances pieces and Kyogen were performed. On the 19th, Kumiodori Yaguranuhiya was performed. Many residents and people from other communities joined the event and enjoyed the traditional performance. Before presenting on stage, the youth performed a valiant Sumakibo in the front yard of the community hall. The stage performance on the 16th and 18th began with Maikata and celebratory dances such as Chojano ufusyu and Shochikubai were performed. 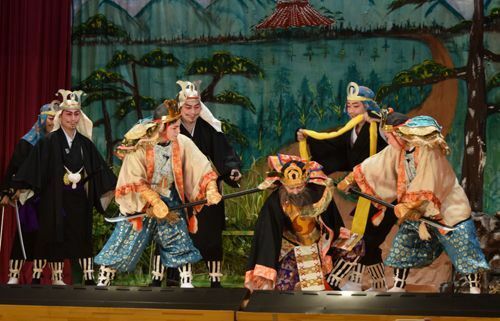 A humorous Kyogen titled Nitohei monogatari (Story of Buck Private) was performed including a scene when Japanese soldiers make fun of their boss. The act brought laughter and applause. A Kumiodori titled Yaguranuhiya was the only piece performed on the 19th. It is a long story that takes about one and half hours with 15 characters. In the story, the owner of Kochi domain, Yaguranuhiya, plots to assassinate Tsukenda nu aji (Ryukyuan local chief) and Tanahara nu aji. The sons of the two aji, Yamato and Torachiyo take revenge for their fathers. The performers’ had clearly worked hard to prepare with their unique songs, utasanshin, and other instruments coming together harmoniously.